If you follow me on Instragram, Twitter or on my personal portfolio site you’ll see that I’ve used the phrase “follow the key lines” as a description or bio. The theory of ley lines says that certain prominent sites, like mountain tops and trees, line up with each other in such a way that they imbue the space between them or near them with mystical power or that a combination of natural and manmade landmarks helped guide ancient travellers across the landscape. Although you can easily draw a straight line from one random point to another and connect a number of random points in between (giving the illusion of order from chaos), I think that using cultural ley lines is an important way of arriving at insights. We often have a lot of data points or information to look at, and it isn’t always easy to connect the dots. Sometimes doing so takes a few leaps, and you'll have to use another piece of data as a reference point. At worst, you'll come across some interesting territory you might not have explored before. So to that, you’ll always find me following the key lines. They might not always take me to my destination, but I know I’ll learn something along the way. If you read the previous post, you'll have noticed that BlogCampaigning has moved over to Squarespace. We started out on Wordpress.com in 2006, and sometime around 2009 I moved the site over to a version of Wordpress hosted using Dreamhost. At the time, going with that fully customisable version of Wordpress made a lot of sense. It taught me how to code CSS. I learned a little bit about designing, and installing plugins on the site, and I also learned a little bit about design. Things have changed since then. It's an old excuse, but I honestly don't have as much time for blogging as I used to do (I chalk it up to the fact that these days I spend a lot more time DOING the cool digital projects I started out admiring, and so don't have to write about them as much). Our old version of Wordpress got outdated, and it would have taken a lot of work to bring it up to speed and designed the way I wanted it. In our increasingly mobile world, a change was needed. I'd heard of Squarespace, and first did some testing with it to set up a personal portfolio sit (ParkerMason.net) to see if it had the features. 1.) Mobile-friendliness: I wanted to ensure that posts on the site were easy to browse and read on a mobile device. 2.) Simplicity: I don't think I need a lot of fancy features on this blog - I wanted a platform that was easy to use so that I could focus on writing, rather than spending my time with code and updates. 3.) Aesthetically Pleasing: I've tried my hand at designing sites a few times, and am willing to admit that it's not my strenth. When I first started blogging, there were only a few choices: Wordpress, Livejournal, and Blogger. Now, I'm sure there are hundreds of choices and many of them would probably meet the needs I've listed above. I could probably even start fresh with Wordpress, but I wanted to try something new with this. Let me know what you think of this new version of BlogCampaigning, if you've got any great Squarespace tips or other blogging/content platforms you like to use. If you're reading this, you've found the new home of BlogCampaigning. It's still at BlogCampaigning.com, but I've moved from Wordpress to Squarespace. Stay tuned, because I'll have some more posts soon. Year after year, the whisper of Christmas arrives on the autumn wind. With a little help, the whisper builds quickly to a song and then a shout. Frenzy grows. Shoppers are trampled. How does it happen? I have some ideas that may account for the popularity and success of consumer Christmas. Consumer Christmas is based on an existing broadly recognized cultural-religious holiday, which gives it legitimacy, but it has been effectively expurgated of all spiritual meaning, which means you don’t have to be Christian—or even religious—to celebrate it. It has persistent and wholesome themes (charity, selflessness, giving, family, light in the darkness). In our fast-paced convenience culture, with little time to make gifts or really even think about them, the theme of giving means buying. It has simple symbols (trees, stars, snow, wrapped gifts, red, green), which allow it to easily spread and adapt to different places and cultures. 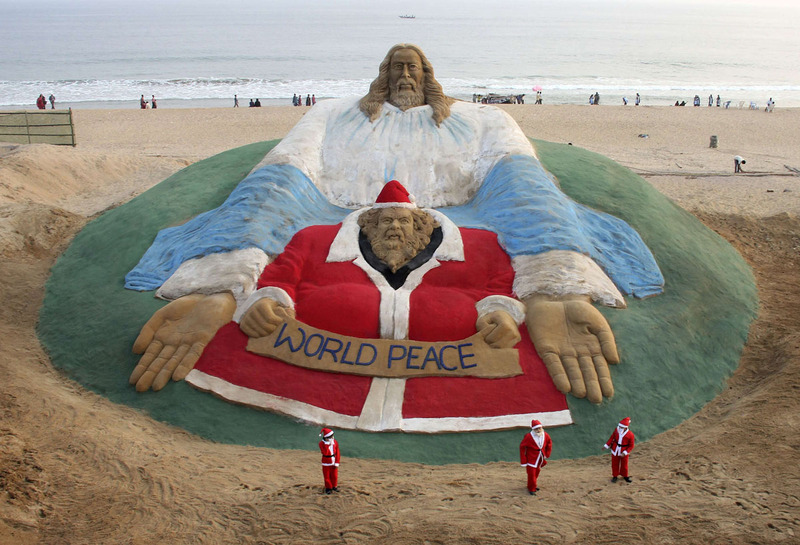 And it has honourable mascots (Santa, Jesus). Who doesn’t root for poor babies born in barns and jolly eccentric old white men who bring gifts to the good children and coal to the bad ones? Followers defend it vehemently, whether or not they have a faith connection to it. You never need to tell people it's coming. Everyone already expects it. Its power of truncated tradition and manipulated myth combine to create a gravitational pull that sometimes traps other events, like Boxing Day, in its orbit. Other pure marketing schemes, like Black Friday and Cyber Monday, try to ride the gravitational wave to prominence. No other holiday is more associated with a child’s smiling face as she unwraps a gift. Today, however, these anticipation and joy have moved from the holiday to the everyday. We have elevated unwrapping to an art, a spectacle to share with the world, and called it unboxing. This is the power of consumer Christmas. I haven't got a clue what you can do with this information. Okay, maybe I have one clue. I guess don’t mess with success is the best I can assess. It’s a fair bet that until Jesus returns, Santa will be his lieutenant and consumer Christmas will march around every year, everywhere. It's hard to out-promote a man who selflessly travels the globe bearing gifts for all. (You don’t hear too much about the kids who get coal these days.) It's also hard to be heard above the noise. I've got a few questions, too. What if marketers always acted like they were selling to one person? That seems to be the goal of much marketing today, but does it succeed? What would that mean for Christmas: compassion, authenticity, humanity? Does this work? Without a sincere connection to the traditions of Christmas, how can a consumer respond to these themes in Christmas marketing? I don't know! So please let me know what you think in the comments or on twitter. Last week, a friend of mine emailed me to ask my thoughts on how he get started as a digital strategist. My response was a bit rambling, but I think I can boil it down to a few key thoughts. 1.) Don't Be a Generalist. These days, everyone has a base level of knowledge about how digital and social media work, and even the grad fresh out of ad school has "Digital Strategist" on his résumé. Yet many of these people don't have any deep understanding of how an online campaign actually works, or think that a shotgun approach of trying as many different channels as possible is the right way to go. My friend already has a head-start in email marketing and SEO, and I suggested he focus even further on these. As digital budgets within agencies grow, there will be more room for people with this type of specialization and it will be this type of specialization that will help drive results. 2.) Have a Few Case Studies. Specifically, case studies that demonstrate effectiveness and a return on investment. If you're just getting your start, it will be tough to provide case studies. Again, in my friend's example I recommended he spend a bit of time helping another friend of ours build up their online business, and using the results as a bit of an SEO/SEM case study. 3.) Meet People. I think my friend's approach of reaching out to me as someone in the industry was a great first step, and that he should continue reaching out. Finding out different perspectives from other Digital Strategists or potential employers will help guide my friend both in understanding more about what he needs to work on specifically and if it's even something he wants to get into. I'm always incredibly thankful of all the people I met when I first moved to Toronto a while back and who gave me advice and pointed me in the right direction when I was getting my start in the communications business. I also believe that for right or wrong, a big part of finding a job is about who you know, not where you apply. I don't think any of the jobs I've ever had came as a result of seeing a posting and applying, but rather came about through a personal conversation with someone. I'm sure there is more to it than that. Do you have any advice for my friend? Leave a comment or shoot me a tweet (I'm @ParkerNow) and I'll update this post. Welcome back to another edition of Drone Week here on BlogCampaigning! This series of posts It certainly seems like drones are everywhere these days, and one area where they're really making a mark is in surf videos. A lot of waves are tough to shoot from the shore, and filming from the water often means that videographers aren't able to capture an entire ride. Drones are perfectly positioned to capture surfing, and the overhead angle often gives the action a dreamy look. Check out a couple of examples of surfing drone videos below. I like to fly from stugibson on Vimeo. If you want to capture some of this footage yourself, the AirDog might be a good bet. I'd say that that biggest problem is that it only has a 10-20 minute flight time. As some commenters have noted, you can't even paddle out in that time in some spots. I feel like this is only the beginning of drones used for surfing footage, and I expect we'll see even better stuff in the future. Check out past Drone Week posts on BlogCampaigning. Drone Week - January 12 | Injuries! Ethan Hawke! Trends! Swarms! Welcome back to another edition of Drone Week, my (occasionally) weekly recap of all news drone related. How many people got drones for Christmas? As I mentioned in a previous posts, it looks like interest in a drones is at an all-time high. There were quite a few new consumer-friendly models released over the past few months and based on these Google trends for "Drone Instructions" and "How To Fly A Drone", with interest skyrocketing in January, I bet they sold well this holiday season. How many of those people got injured? There was a great Reddit thread this week about a user who had very nearly crashed their drone into water on the first day of flying it. While many had a good laugh at the "pilot's" expense, many others rightly pointed out that this guy shouldn't have been flying the drone so high or without a clue how it worked (in a populated area, and over water!) on his first day. One of the comments there linked to a gallery of images people sustained from drones. Click through at your own risk. Lastly, the trailer for the movie Good Kill starring Ethan Hawke looks like it will be pretty good, dealing with the emotions of the US military drone operators. Will we see drones as a plot device in more movies over the next year? That's it for Drone Week this week! Send me a Tweet at @ParkerNow if you see any other drone-related news stories that are worth sharing. Quadcopters are easy to make and cheap because they move the complicated aspects of proper helicopters out of the mechanics and into the elctronice. Usually this is a good strategy - but not here because the side effects of doing this mean that they are unflyable in anything but perfect weather because of the lack of control authority. Since a proper collective pitch micro-helicopter can be purchased for around $100 nowadays ther is no reason to use a quadcopter. For many applications a fixed wing aircraft will be better. It puzzles me that calling a model aircraft a "drone" somehow makes it a new piece of technology. It isn't - it's just a model aircraft = and in the case of a quadcopter a pretty badly designed one at that! The author makes a good point, in that the technology being used isn't really that new or innovative. However, I think he misses out that the development of the flight stabilising electronics, as well as the decreased costs of some of the components, have made this hobby much more accessible to the greater public. This in turn has helped drive further innovation and interest in the field, which is never a bad thing. Next up is the use of drones to track the health of killer whales. The footage is beautiful, but more important is the reason why they're doing it. Read more here. Lastly, the Audi Car Drone. I suppose that as a car, it's not really a drone in the way we might normally think about them, but as a self-driving vehicle on a race track, it's pretty neat. I'd like to see this entered into an actual competition at some point to see how it does against human drivers. That's it for Drone Week. A few months ago, I had the chance to visit Tokyo to work with the DDB office there. Similar to my trip to Australia last year, it was a chance to return to place I'd once lived, visit some old friends and meet some new colleagues. Below are a few pictures from my trip. If you want to see some more pictures from my trip, check out my Instagram page (I'm ParkerNow there), starting with this image. Last week, I talked about the fact that we might have reached "peak drone," the idea that public interest in drones and quadcopters is waning. That doesn't mean there isn't a use for them. I feel like over the past few months, there's actually been more "useful" articles about drones, rather than the fun and gimmicky ones like the burrito delivery drone. Anyways, time will tell. Here are this week's round-up of drone-related news stories: Apparently France is accusing rival soccer teams of using a drone to spy on them at their training camp in Brazil for the World Cup. However, it is still unclear if it's actual spying that's happening or, as the article says, an enthusiastic fan. The former is definitely a more interesting news story, but the latter much more likely. Maybe you'll be able to see video of that training footage on TravelByDrone, a site that aims to give you a drone-based view of the world in the same way Google StreetView gave you a car-based view. The site's team is manually vetting and adding new drone videos to their site at a few hundred a day, according to TechCrunch. Drone Week - Have we reached "peak drone"? Another week, and and drones continue to show up in the news and the blogs. What follows is another of my regular round-ups on the topic of drones. Firstly, have we reached Peak Drone? I plugged the word "drone" into Google trends, and it spat out the following chart (along with a bit of a forecast). It's not necessarily the best indicator in the topic, but it looks public interest in drones peaked a few months ago, in December 2013. Either that, or they're becoming so commonplace that people don't need to search for them anymore. Next up is a cyberpunk-ish video by M.I.A. feature not only drones, but also 3D-printed guns and a glitchy vibe. The whole thing feels like a 90s dream of what the future should have been, but it's still pretty cool. Watch it here. If you want to terrify your dog and annoy your neighbours, then getting a drone to take your pets out to poo is probably the way to go. And apparently the Lithuanian mob has gotten into the drone business, using a gigantic specimen of one to smuggle cigarettes into Russia, 22 pounds at a time. And finally, a team is working on creating a type of aquatic drone that will gradually clean the world's oceans of all that plastic. Good luck, guys. That's it for Drone Week on BlogCampaigning for now.